Image: Courtesy of Siar A Rachas Muid Productions Ltd.
A delightfully suggestive pastiche of seven interrelated episodes about life, love, marriage, aging, disappointment, commerce – and a few other things – in a small Irish village. 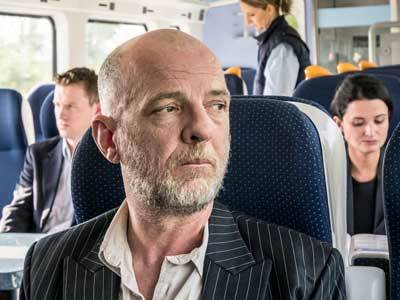 Daniel (Liam O Mochain) starts work in a lost and found office at the local train station, encounters all sorts of people and situations including a baby delivered as lost, beginning a small odyssey of events and complications that surround him, told through seven tales taken from, or at least inspired by, real situations. Emerging from one of the tales that forms this aggregate, the story of Daniel’s friends Gabriel (Seamus Hughes) and Síle (Aoibhin Garrihy) work hard at the prospects of togetherness, and the three of them, along with their local compatriots exhibit all of the curious interlockings of young people in a small town. Largely light in tone, involving romances, promising and obscured, impending weddings, a failing pub and reconceived schemes to bring it alive, the stories also touch briefly on heavier themes. Senile dementia figures in, as does a grandmother who came to Ireland via the kindertransport which in late 1938 enabled two hundred Jewish children from Eastern Europe to find safety there. Filmed over the course of five years on a small budget, the film manages, throughout its seven somewhat separate episodes, to convey a sense of unity. To boot, all of these stories are, to one extent or another, inspired by accounts of true events. Like notable films which amalgamate a series of stories like Short Cuts (1993), Paris Je T’Aime (2006), or New York, I Love You (2008), each of its episodes stands considerably well on its own. However, Lost & Found, much like New York, I Love You, also ties stories together. One might well say that in Lost & Found the narrative thrust of the film, and the double-entendre of its title, derives from the way in which certain of its themes interweave. Liam O Mochain is not only the director of the film but its star as well. His portrayal of Daniel gives a particular ironic twist to the entire goings on, not only as the newly hired employee of the lost and found enterprise at the railroad but as a figure in the larger romantic comedy underlying several of the episodes. O Mochain lends a kind of sweet wryness to his role that notably focuses the film’s themes, particularly in the end. I won’t give away how that happens, but suffice it to say that his utterance of a particular line and the emotional tone he lends it offers a charming evolution to several lines of development. I had the pleasure to speak with O Mochain earlier this week while he was still at home in Ireland before his embarkation to the United States on an extended promotional tour for the film which takes him, this week, first to Boston and to the North American theatrical debut of Lost & Found at the Kendall Square Cinema in Cambridge as part of a regular run and as a featured element of the Irish Film Festival here. In particular, I was curious about the character who is said to have arrived in Ireland as a result of the kindertransport. That mission, put together by the British, enabled 10,000 mostly Jewish Eastern European children to escape the Holocaust by placing them in homes in Britain. Over two hundred of those children were settled in Northern Ireland. Even though the kindertransport children landed in Northern Ireland, the setting of Lost & Found is not intended to be there but in the Republic of Ireland, though its particular location in the Republic of Ireland is not specified. Though, indeed, elaboration on that theme might have added a significant dimension to the film, it’s clear that the light overall tone of this collection of stories is not intended to go that way. The theme is used as a vehicle for a somewhat humorous, though poignantly motivated, subplot. The implications of the kindertransport, with its Holocaust-related associations, however, immediately lends a weighty tone to the narrative, so its oblique usage is, in some ways, a bit difficult to dissolve into the lighter thematic context. The theme of senile dementia, though weighty as well, is offered in a sweetly poignant way through the tales that touch on it. Its inclusion offers a tone of realism to some of the otherwise more boisterous goings-on and provides a reasonable tonal complement in this miniature of small town life. The romantic developments in Lost & Found have a dominantly frivolous rather than penetrating quality which emphasizes the ironic and happenstance element of the narrative, despite a hint of an alternative to this near the end. “You go down to some of these small country towns in Ireland and you’ll see people ending up with people you never imagined. If you stay somewhere and you don’t leave, that becomes your natural habitat. That’s the well you’re getting everything from,” reflected O Mochain. In addition to the other so-called portmanteau (or composite) films mentioned above, O Mochain mentioned 7 Days in Havana (2012) as a particular inspiration. “It’s a beautiful, beautiful, beautiful film. Each of its seven stories begins at six in the morning and ends at six the following morning. So that’s where I got some of my inspiration, as well, for the seven stories in Lost & Found,” he said. Much of the acting in Lost & Found is subtly wonderful and it is filled with great moments. Like the great Irish comedy Waking Ned Devine (1998), Lost & Found gives an endearing portrait of life in a small Irish town, conveying all the internal connections that reveal its seemingly simple life as far more rich and complex than it appears. The film opens, with its North American premiere, at the Kendall Square Cinema in Cambridge on Friday, March 22. Liam O Mochain will be available after the 7:15 screening on Friday evening, March 22, and after the 2pm screening there on Sunday, March 24, as part of the Boston Irish Film Festival, to answer questions.